A full line of ergonomic wire cutters and pliers that feature ESD safe handles with static dissipative hand grips and come in a wide variety of styles designed for performing specific cutting, trimming, holding, bending, and forming tasks. These tools conform to ANSI/ESD.S20.20 and DOD-HDBK-263 for protecting electronic devices. Constructed from high-carbon steel and designed with optimum leverage, Xuron® ESD Safe Cutters & Pliers have Xuro-Rubber™ cushioned rubber hand grips and Light-Touch™ return springs. Xuron Corp. has introduced a full line of ergonomic wire cutters and pliers that feature ESD safe handles and come in a wide variety of styles designed for performing specific tasks. 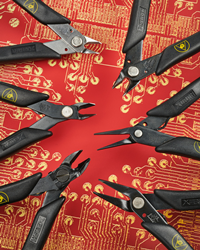 Xuron® ESD Safe Cutters & Pliers feature static dissipative hand grips with a surface resistivity of 106-109 ohms which conforms to ANSI/ESD.S20.20 and DOD-HDBK-263 for protecting electronic devices. Included are Micro-Shear® Flush Cutters which produce clean, square cuts and come in a wide range of models with special features such as lead retainers and pliers are offered in many models for performing specific holding, bending, and forming tasks. Constructed from high-carbon steel and designed with optimum leverage, Xuron® ESD Safe Cutters & Pliers have Xuro-Rubber™ cushioned rubber hand grips and Light-Touch™ return springs. Ideally suited for assembly, repair, and field-service personnel, the cutters come with various head angles and the pliers come in 10 different head styles for specific uses and materials. Xuron® ESD Safe Cutters & Pliers are priced from $10.50 (list), depending upon tool. A complete catalog and price list are available.